For the first time Neil and I ran a stall at the Great Yorkshire Show. It was great to be in Yorkshire as this is where we first started getting Pasture Promise assured free range milk to the market. Back in 2014, we sat around a table with farmers, Dales Dairies and Stephenson’s Dairy to discuss the logistics of getting the first ever free range milk to market. So it was a great feeling to return to Yorkshire, where it all started and we will be back again for the Skipton Food and Drink festival this weekend. At the Great Yorkshire Shows thousands of people came through the doors, seeking out the wide variety of stalls and demonstrations but, at its heart, the Show still has its food and farming roots. It just so happened that the second day of the show was Cow Appreciation Day, a day we like to celebrate each year, to give thanks to all the wonderful cows who provide us with great tasting, free range milk. On that day over a 1,000 people tried a shot of Pasture Promise free range milk and they loved it. They also loved the story about how and why we started Free Range Dairy Network and the fact that an appreciation of the needs of the cows is at the heart of our values. The grazing rights of cows and the freedom to express natural behaviour helped shape our production standards. 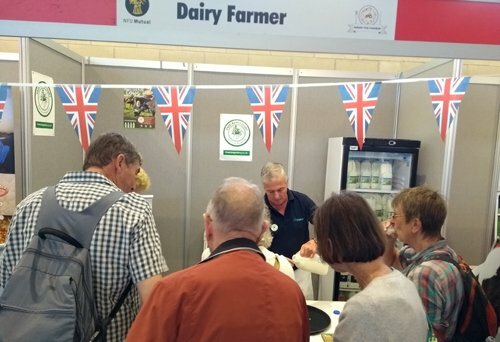 The number of people coming to our stall demonstrated that so many now want to know where their milk comes from and the type of farming system that produces it. Getting in front of so many people proved to be a fantastic way to tell them our story. We want to replicate this again this weekend which this time will be on a Free Range Dairy Farm. We will be organising farm tours so people can see first hand how important the welfare of the cows are to us. Mintel’s 2018 dairy report shows that animal welfare is still a key issue when deciding which milk to choose, 42% said animal welfare impacted their purchasing decisions, with 81% happy that the UK has regulators to ensure adequate animal welfare standards in dairy farming. This is something consumers don’t see as red tape but vital to ensure the health and well being of cows and the safety of milk production. There has been a lot about plant based alternatives to milk, in the media and veganism is seen as a huge threat to the dairy industry. But, a Mintel report shows that 96% of the population still use cow’s milk and 86% of those who buy plant-based alternatives, still buy cows’ milk as well. I think the work vegans have done has shone a spotlight on the dairy industry, making people think about their milk. But, for those that don’t want to go vegan and are looking for greater assurance about how that milk was produced, we can provide that. Our standards are there to provide the best quality of life for cows and as Free Range Dairy Network grows, more and more cows are secured the freedom to graze in fields, as nature intended. As we grow and people ask more questions, we see that others want to use the words free range as an easy marketing ploy. Its done with no thought to the damage it does to the work we have done and are doing for pasture based dairy farmers in the UK. Free Range Dairy Network is the only organisation committed to a clear standard on grazing rights for cows. Organic producers may claim that all organic cows are free range, but there is no clear standard in place to state how many days cows must be grazed each year. In January we published the number of each farms grazing record with farmers achieving 252 days in some cases, much more that the average 200 days, and we will publish these records each year. Not an average grazing days but the exact days that cows were given the freedom to graze. The dairy giant, Arla, uses the words free range on it’s organic milk, on the basis of an historic survey of producers to give an average number of days at grass. But this provides no assurance about how long the cows on individual farms will be grazed each year. This is a type of marketing that could undermine all the hard work we’ve done to make a difference for pasture based dairy farmers that neither wanted to go organic or run a large intensive farm. It doesn’t help cows, it doesn’t help the farmers committed to grazing their cows and it doesn’t help consumers wanting to make a clear and informed choice when buying milk. If you want a clear way to support traditional family farms and keep cows in fields, look for the Pasture Promise logo when buying your milk. If you want to take part in a farm tour at Skipton Food and Drink festival please visit the event on our website for further information.